Atoms come from a variety of backgrounds, beliefs, and ways of looking at the world. And despite what you’ve heard about software makers, we don’t all like video games and craft beer. Instead, we share six values that form the foundation of everything we do at Atomic Object. Atoms don’t do things halfway. We fully invest ourselves in our work, relationships, and communities. Because if a thing's worth doing, it's worth doing extremely well. The team was focused, dedicated, and had genuine interest in what we’re doing. They cared about the project, and that came through in their zeal. They took the time to truly understand what we were trying to accomplish and delivered a great product. Jim Nicolette, Van Andel Education Inst. We want to create the right thing the first time, and have it still be meeting needs for years to come. That means thinking and planning ahead, on projects and internally. Life has a lot of ups and downs, but Atoms pull together. We act with kindness, empathy, and respect, and we share each other's burdens — personally and professionally. Software moves fast, so we’re always learning and honing our craft. And we intentionally spread it around, so everyone at Atomic gets smarter. We call it the Atomic Brain Trust. We're accountable to our clients and each other. That means being open even when things aren't going smoothly. It's just the right thing to do. Atomic is a place of respect, support, and friendship—where every person can be their genuine self. We’re working hard to build a diverse and inclusive team and to create rewarding careers for all of our employees. We believe a strong, positive culture leads to happier people and better products. And we’re not the only ones who think so. In 2018, Atomic was named to Forbes' annual list of the 25 best small businesses. In 2017, the Detroit Free Press recognized Atomic on its list of Top Workplaces in Michigan. In 2017, Fortune Magazine named Atomic to the Inner City 100, for its commitment to bringing business to urban areas. In 2017, the Michigan Breastfeeding Network named Atomic a Gold Level Breastfeeding-Friendly Workplace. In 2016, the Families and Work Institute awarded Atomic with a When Work Works award for our effective and flexible workplace. 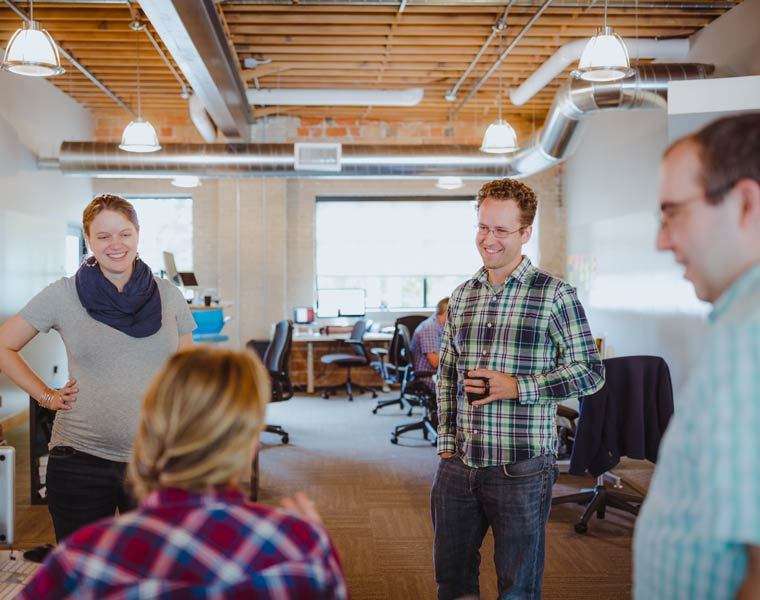 In 2014, Atomic was named a Cool Place to Work by Crain's Detroit Business. If you care about the same things we do, consider becoming an Atom. We’re always looking for smart, curious people who love making software. Are you ready to experience Atomic first hand? Give us a call. We’d love to hear about your project.